Bake bread as directed on package. In medium bowl, combine ground beef, sausage, bread crumbs, onion and egg; mix well. Shape into 16 (1 1/2-inch) balls. In medium skillet, cook meatballs over medium heat for 5 minutes or until browned, turning frequently. Drain. Add pizza sauce. Reduce heat; cover and simmer 12 to 15 minutes or until meatballs are thoroughly cooked. Slice each loaf open, sandwich-style. 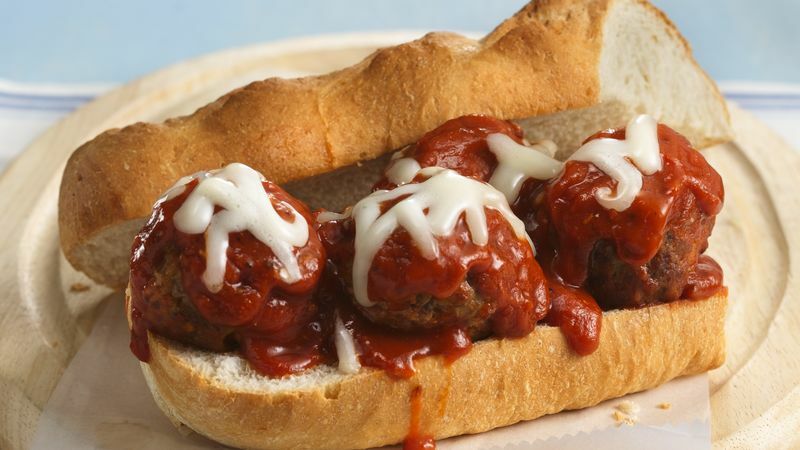 Place 8 meatballs in each loaf. Spoon sauce over meatballs. Cut loaves in half to make four sandwiches. Sprinkle with cheese.